Snapping awake sometime before dawn, I extracted myself from sleeping bag and tent as quietly as possible so as not to awaken my tentmate. Snuggling in down parka, alpaca cap and mittens, I found a perch on a rock in the front row of the sunrise lightshow over the Cordillera across the deep gorge below. I could hear our cooking crew laughing and singing in the cook tent, and our donkey drivers whistling and whooping from a far distance as they herded our burros back into camp from a gully where they had grazed overnight. Omnipresent cows mooed. Soon David and Maximo – horsemen and all-purpose camp helpers – would begin making their way from tent to tent with the red thermos jug and tin cups: “Good morning! Coca tea? Coffee?”. After nine days, the rhythm of our mornings was well established. 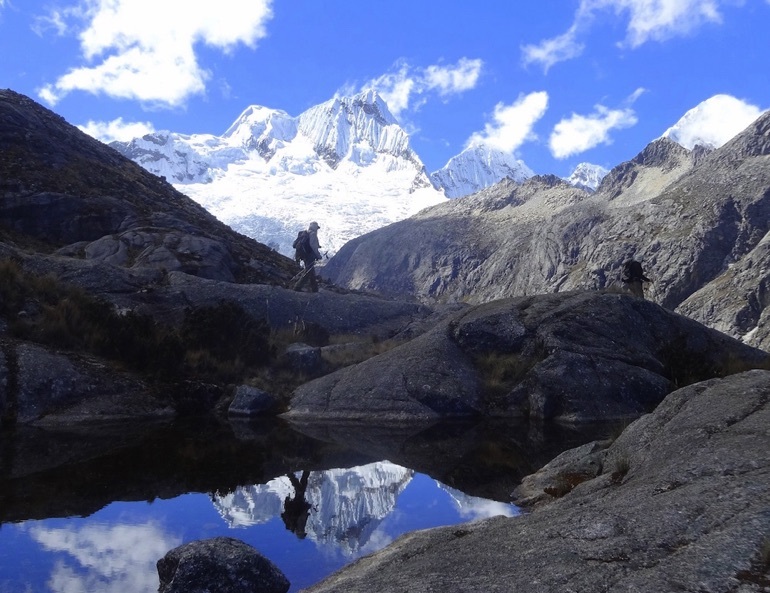 Our group of eight was waking to our tenth day of the remote 11-day Alpamayo Northern Circuit in the Cordillera Blanca of Peru. We were well into our fourth week in the country after touring and trekking for two weeks around Cusco, the Sacred Valley and Machu Picchu. After nearly a month away from home, the knowledge of the impending end to our adventure was bittersweet. The Peruvian Andes had proven to be a rich multi-course feast, and we were savoring our last delectable bites. As much as this was a trek among the stunning peaks and glaciers of the central Andes, it proved even more to be an unforgettable glimpse into the lives of the hardy Quechua farming and herding families who people the remote valleys between them. Vivid images come to mind. A tiny church with bright blue shutters in the little village of Vaqueria, vigorous singing from the unseen congregation spilling through the open door. Small stone houses with thatch roofs and fields outlined in hand-built stone walls, miles – and days of walking – from any town. A shepherd and his young son clattering past us down the path with their herd of sheep. 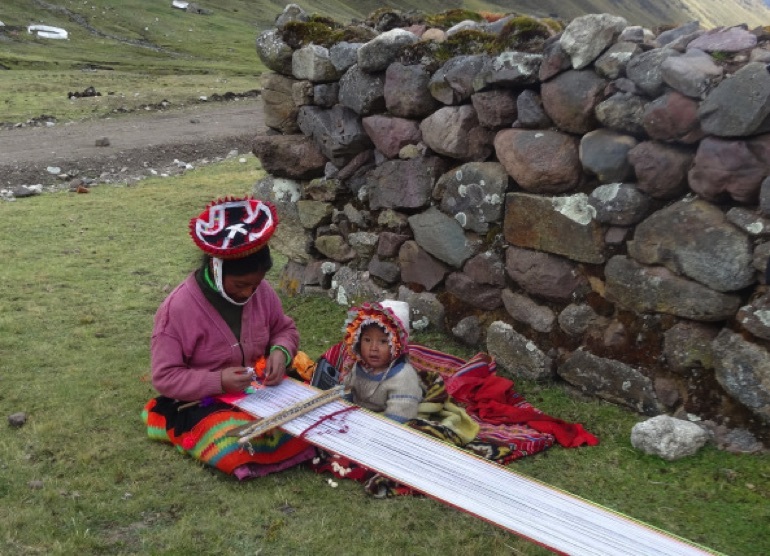 A young woman and her baby in bright native dress sitting on the ground by a stone wall, weaving on a long narrow loom while overseeing her flock of llamas on the hillside. 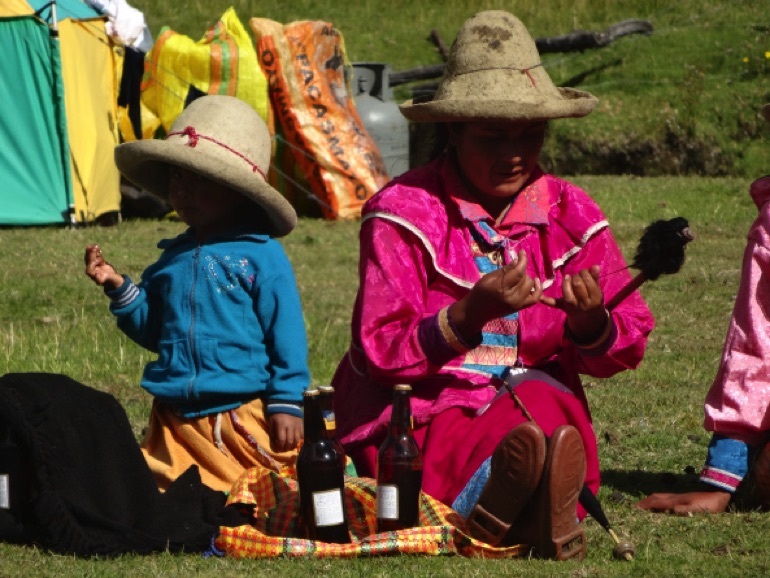 A line of women in native clothing gathered by our camp to spin wool and sell beer to the gringos; nearby, two young girls laughing and batting a ball between them, and older boys and girls flirting and playing an impromptu game of futbol in the afternoon sun. A starkly beautiful teenaged girl and her toddler brother or son minding their alpacas in a high valley days from civilization, stopping at our approach to watch us, shy and solemn, hoping we'd have something to give them. One cannot pass through this human landscape without absorbing a strong sense of timelessness, of incredible dignity and fortitude, of color and joy and pride of culture and family ties held tightly in the face of incredible hardship. And yes, the physical landscape was all the imagination could conjure and then some. 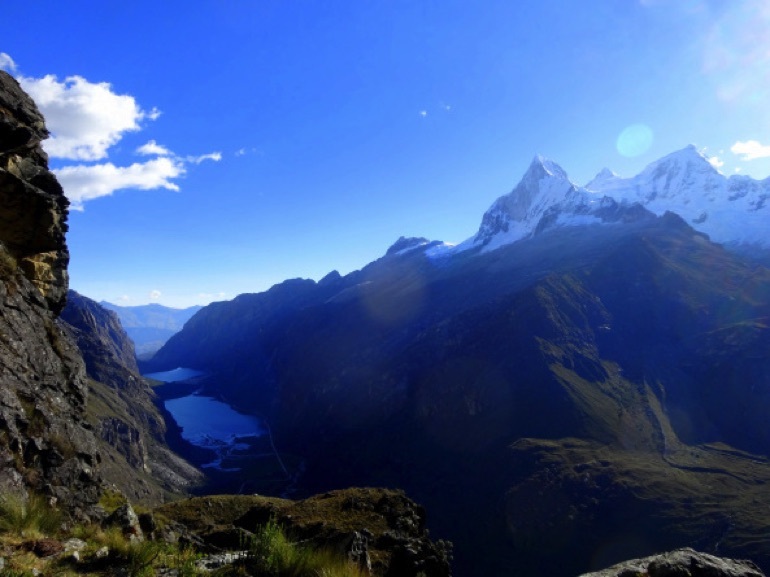 The peaks in this part of the Cordillera Blanca – most between 18,000 and 22,000 feet and heavily blanketed with snow and glacier – form massive nearly parallel spines boxed between eastward- and northwest-flowing river valleys. Some rounded, many sharply craggy, all rising in steep cliffs beribboned with waterfalls and glistening with snow and ice, their visage was massive, powerful, forbidding. In dramatic contrast – like a lush shawl tucked around their laps – the river valleys wrapped vivid green between the massifs. Like jewels on the shawl were dozens of tarns and lakes in vivid emerald, turquoise and azure, stretching down the long glacial valleys or perched on benches stepping up the sides of the peaks, reflecting the crags above. The Andes are still growing at centimeters per year as the Nazca plate pushes inexorably under the western margin of the South American continent. Evidence of the youthful violence of this terrain is everywhere. Most striking – and horrifying – are the massive scars of a 1970 landslide on the western flank of Nevado Huascaran (Peru's highest peak at 22,200 feet) triggered by a 7.9-magnitude earthquake just off the coast. A giant chunk of the mountain shook loose and a half-mile-wide mass of ice and rock – eventually estimated at over 2.8 million cubic feet – rushed 11 miles in less than five minutes, burying the towns of Yungay and Ranrahirca and killing as many as 100,000 people, in what is so far the world's deadliest avalanche. Our road wound around and above the still evident debris field. A new town, Yungay Nuevo, now bustles above the killing field, the immense snowy massif of Huascaran still looming close behind. Yet the foundation of these mountains is incredibly old. The bedrock of the South American continent – formed in the original cooling of the planet three to four billion years ago – later merged with sedimentary and metamorphic rock when the Pangaea supercontinent formed 250 to 500 million years ago, and this foundation rock was thrust upwards to form the modern Andes 60 to 100 million years ago. Multicolored rock striping the slopes and cliffs reflects this torturous past. Our 65-mile journey circled counterclockwise over nine high passes through several of these river valleys, unfolding exceptional views of the prominent peaks of the range from multiple angles. We chose a less traveled, more challenging route through the Cordillera, and a different starting point (from the village of Vaqueria) – thereby having the incredible scenery mostly to ourselves. Our days unfolded like the best mystery novel, dramatic vistas and indelible experiences earned with steady toil, enriched with laughter and camaraderie. From the first hour the landscape began to reveal its special story of drama and contrast. 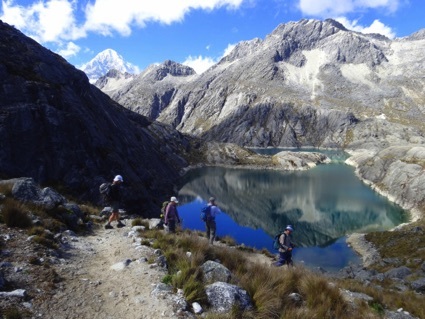 Above Yungay our narrow mountain road skimmed the shore of the steely blue Llanguanaco Lakes under the massive hulk of Huascaran. Our first trail miles – a day's hike on the way to the starting point of the trek – wound gradually, then steeply, through meadows spotted with iridescent blue lupine shrubs, up and over two high moraine benches to sparkling turquoise-blue Laguna 69 at 14,365 feet, the imposing wall and glaciers of Nevado Chacraraju rising sheer on the opposite side. Our cooks served a gourmet lunch on the meadow out of their backpacks, the first of many on this journey, complete with hot tea and watchful cows. From there, our bus crawled over an improbable, incredible, dirt road that switchbacked tightly on the cliff wall over a 14,500-foot pass with vertiginous views west to Huascaran and the lakes below, before dropping in teeth-jarring fashion to deposit us at our first night's camp. In the first of many crystal blue dawns, we met our burros and support crew and started our trek in earnest. Above the village we climbed the lush valley of the Huaripampa river, sharp-toothed snowy peaks framing the horizon. Our row of bright tents awaited us in a verdant valley under the backside of Nevado Chacraraju. The next morning was a much-anticipated side trip, a relentless rocky climb past crystal clear tarns to 15,500-foot Punta Union pass and a panorama down the Santa Cruz valley to a row of immense snowy peaks – Paron, Millisraju, Quitaraju, Rinrijirca – and aqua-blue lakes strung like jewels below. Retracing our steps, we flirted with the summit spire of 19,830-foot Nevado Pucajirca passing fleetingly in and out of the clouds far above. Our tents awaited us in a green valley with ridges rising all around, a waterfall feeding tall marsh grass around still, clear reflecting pools. Our next several days brought a soon-familiar rhythm. Every day before first light, the whistles of the donkey drivers brought our burros from the far hills back to camp where they'd gather placidly to be loaded. Awakening to hot tea and a cooked breakfast, we'd soon climb a pass – sometimes two – to sprawl on the rocks and soak up the sun and views of the peaks behind and ahead. Our laden little burros would clatter over the rocks to join us at the pass, then on down with their drivers trotting alongside to have our camp ready when we arrived. Then we'd switch steeply down the backside of the pass, wildflowers lining tumbling streams, waterfalls catching the sun on the cliff walls above. We'd enjoy gourmet lunches every day in a meadow, or against a rock wall, or next to a tarn. As we progressed eastward, the terrain became drier, golden grass clothing the hills spotted with bright blue lupine and white granite rock. Some passes were rounded grassy knolls, some rocky spines atop giant scree slopes. Our camps often shared valley bottoms with lush tended fields, or with tiny rock-walled houses near grazing alpaca herds. On our fifth night, our little tent city sat at 12,000 feet under a headwall cliff topped by a huge hanging glacier, near a small village in a cultivated valley. A line of village women had gathered on blankets next to our camp and were spinning wool as they waited for us, bottled beer and soda for sale. Village kids engaged in a vigorous soccer game under the snowy peaks. Our seventh day took us over Cara Cara pass at 15,800 feet – a much-anticipated gateway to a cluster of the highest and most renowned peaks in the range, including our trek's namesake, the perfect pyramid of 19,500-foot Nevado Alpamayo. At the pass, a narrow ridge atop a rocky headwall, the wind blasted furiously, and we quickly sheltered in the lee of boulders to survey the incredible views now arrayed before us: vast moraines wrapped around turquoise and deep blue tarns and lakes, under the jagged teeth of Quitaraju, Abasraju, Alpamayo and the three summits of Santa Cruz. Periodically staggering in the gusts, we hurried down the scree to our cluster of tents in the broad meadow below Laguna Jancarurish at the foot of Alpamayo. This was our home for two nights – brilliant sunsets painting the snowfields a glowing peach, icefall rumbling constantly down the nearby cliff walls. We took a day here to wander the ridges and moraines, condors circling overhead, and perched wordless soaking up the view of lakes below and immense peaks above. From there it was a gradual descent on our ninth day past pre-Inca structures, and more rocky switchbacks over yet another nearly-16,000 foot pass, to a camp clinging to the side of a deep gorge. A bright orange-pink sunset reflected fog rolling up the gorge from the Pacific, the ghostly Cordillera Negra on the other side. So here I sat at sunrise on day 10, listening to the bustle of our early morning camp, regret and anticipation intermixed as we approached journey's end. Before the morning sun reached us, we traversed the side of the steep gorge, a little ice crunching and giving sparkle to the moss underfoot. Crossing a narrow rock-cleft pass with Buddhist prayer flags (our highest at 15,900 feet), we quickly dropped to stunning turquoise-blue Laguna Cullacocha, wind rippling brilliant reflections from Nevado Santa Cruz. Rounding the lake past a dam, we followed sturdy aqueducts along the ever-steepening canyon walls striped with black and caramel rock. As the sun set over our last night's camp on a bluff over the tidy fields of Hualcayan, our cooks presented us with pisco sours (a local cocktail made with pisco brandy, lemon juice and egg-white whipped frothy by hand!) and a cake carefully lettered “Congratulations for trek!”. On our last morning on the trail we made short work of the descent through vivid flowerfields to Hualcayan, clusters of homes and fertile fields spotted with men and women working, a mama pig with nursing piglets next to a rushing spring. All too suddenly we were on our bus, trundling down the switchbacks to the highway and back to the northern city of Huaraz, lost in our individual thoughts. We had come for a trek, for physical challenge and mountain views. We were leaving fundamentally changed by a place and a people of stark beauty, fortitude and bright color – a multi-course feast eaten with our fingers, flavors not soon to be forgotten. Cheryl Talbert is a retired forester and confirmed 'science nerd' who lives in the foothills of the Cascade mountains in Washington state, USA, and teaches outdoor skills and leads outdoor adventures for the local non-profit Mountaineers club. Among her passions are taking groups of fellow Mountaineers trekking and backpacking the long trails and high peaks of the world, and writing about the stunning places and cultures they visit and the unique natural history of those areas, at happytramper.wordpress.com and thetravelwriters.net/happytramper/. She also teaches and writes about backpack meal planning and preparation of home-dehydrated backpacking meals on her happytramper.wordpress.com blog.